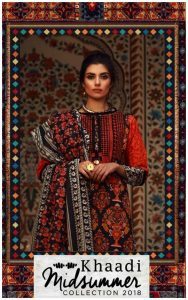 Khaadi Midsummer Printed Lawn Collection 2018. Since 1998, KHAADI has managed to spin a contemporary design without losing its origins. A store that houses innumerable cultural designs that have been praising all men, women and children for the past 20 years. With each collection that fits the eyes of fashion, Khaadi has remained true to its spirit of ethnic and global design. We are super excited that your new Midsummer lawn collection is now available. Inspired by the majesty of the East, Khadi’s new MESSUMMER LAWN COLLECTION is a must! Whether you like to wear prints or embroidered prints, this collection has 119 versatile designs that have something for every woman.